We offer transparent packing tapes which are mainly used for taping up cardboard boxes or other parcels. The tapes stick to the surface perfectly and permanently join two elements together. We offer tapes in standard size 45 microns x 48 mm x 60 meters, covered with acrylic or rubber adhesive. They are made of high quality materials that will not crack in transportation. Therefore the taped products are well protected. The fact that the tape is transparent makes it possible to pack all kinds of products without the risk of covering some important elements of the items. 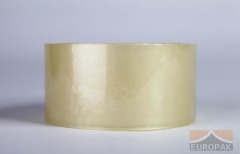 Type of adhesive: acrylic or rubber.